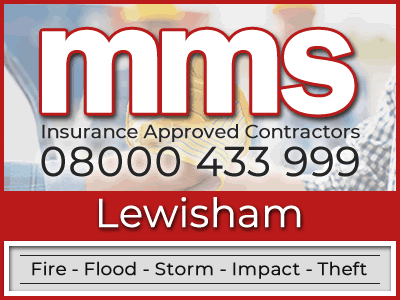 When your home has suffered damage after a flood, fire or storm, MMS Building Contractor Network are here to assist you. We are a nationwide group of building repair experts. Our job is to ensure your home or business is brought back to its pre loss state with as little inconvenience as possible to you. Our network covers Lewisham and all surrounding areas. MMS contractors are selected based on their building repair skills and flood and fire restorationexperience. If you're unlucky enough to have experienced fire or flood damage to your property MMS Building Contractor Network are accessible around the clock through our nationwide helpline. MMS realise that when a building is damaged by fire it can turn your life upside down. As well as the damage that has your property has suffered there could be personal items that you may never be able to get back. We can take some of the burden off you by not only repairing your fire damaged property back to its previous state, we are able to offer help and assistance in making sure you receive all you are entitle to with your insurance claim. Our Lewisham fire restoration technicians have the knowledge and ability to repair the damage resulting from a fire to your property. This can include managing any water damage which often happens from putting out a fire. Also there could be damage such as burned out wiring that could need to be repaired or even smoke damage. Something you can be assured of is that no matter how much damage there is, our experts will manage the task from beginning to end. For all work that MMS complete, we offer a full guarantee. We can suggest and even cover the costs of an independent loss adjusting group to deal with your fire insurance claim (see loss assessing section). Over the last decade, flooding in the UK has become more frequent and has needed more support all across the UK. More areas are being affected by flooding, so MMS have employed more technicians in order to cover the increased demand. However, rest assured that MMS will continue to provide the same level of service that you have come to expect. With any flood damage, it is important to take certain measures before restoration work can begin. Using their specialist drying equipment, our Lewisham flood restoration team will have to eradicate any remaining dampness and water within the inner structure on your property. Flood water can often find its way into hidden parts of a building - this water damage is often not instantly identifiable to the untrained eye, so it is essential that cameras are used to find and treat the damage. If this is not identified and dealt with, it can cause complications after the visible damage has been repaired. Whilst there is water or moisture hidden within your home, bacteria and dampness can breed. This can become a health hazard to any residents of the property and needs to be dealt with quickly, which is why MMS use equipment designed for the detection and eradication of deeply ingrained water. This includes drying machines which track any electric consumption so you can claim back the costs of electricity from your insurer. When you submit a claim to your insurance company they may ask you to obtain a couple of building repair estimates. We aren't general building contractors simply because we solely work as insurance approved builders which only repair properties which have suffered damage from flooding, fire, escape of water or theft. Call MMS today on 08000 433 999 to receive a building repair quote from our insurance approved building network. If you prefer, please feel free to fill in our online builders quote form with a bit of information and we will get back in touch with you as soon as we can. To make sure that we provide the best service possible to our customers, we work closely with a group of independent loss adjusters. As a result we can now offer a free loss adjusting service to our insured customers. The main benefit of this is an independent loss adjuster will work on YOUR behalf instead of for your insurer. This way they can negotiate directly with your insurance company to ensure that you are compensated fully. The loss adjusters that we recommend make sure that all damage is discovered at the first instance. This ensures that problems do not arise once your insurance provider has initially settled your property damage claim. When you hire us to undertake your fire or flood damage restoration work we provide a free loss adjusting service to all our insured clients.